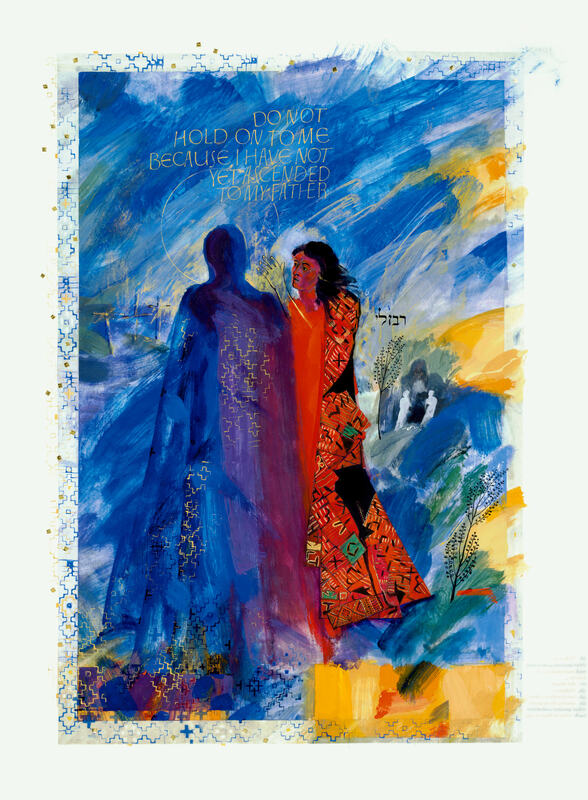 Resurrection, Donald Jackson, Copyright 2002, The Saint John’s Bible, Saint John’s University, Collegeville, Minnesota USA. Used by permission. All rights reserved. As you take a few minutes to look at the illumination, what is the first thing that catches your attention? Is it the contrast of the light and dark colors between Jesus and Mary Magdalene? Is it the gold lettering? Maybe it is the crosses and the tomb in the background of the illumination. Easter is a season of movement and layers of divine revelation, which are reflected in this Resurrection illumination of John 20:1-23. This illumination tells the story of the journey from Good Friday to Easter Sunday. Starting on the left side of the illumination with the three crosses, our eye then travels to the empty tomb. There has been a physical movement of Jesus’ body from the cross to the tomb and from the tomb to the resurrection. Imagining Jesus calling our name moves us deeper into the scene of the illumination, allowing different aspects to catch our eye. The hues that lead us to the image of Jesus are dark; they begin to lighten as our eye starts moving to Mary Magdalene. She is portrayed in red. Her arm is pronounced in gold as she reaches for Jesus and there is gold and light under her feet. When Mary Magdalene recognizes Jesus’ presence and the light he exudes, the gold in Jesus’ garments stands out and divine revelation starts to take over the story. Next Jesus says to Mary Magdalene, “Don’t hold onto me I have not ascended to my Father. Go and tell my brothers that I am going to ascend to my Father” (John 20:17). Mary Magdalene is commissioned to go. According to John’s Gospel, Mary Magdalene does not walk. She runs to tell Peter and the others what she has seen and what she has been told. During this Easter season may we pay attention to the movements from darkness to light, from death to life in our own lives. And may we run with zeal to share our own divine revelation of the Risen Christ. Tracy Dereszynski, OblSB is the Director of Adult and Family Ministry at St. Francis Borgia Church in Cedarburg, Wisconsin. She is an oblate of Saint John’s Abbey in Collegeville, Minnesota. This entry was posted in General, Lenten Reflection, Lenten Reflection 2016 and tagged The Resurrection by Seeing the Word Team. Bookmark the permalink.